Don't miss Contempt of Court: A Contemnor's Guide to the Legal Universe. Respect and understanding of a court of law is not always readily grasped by those caught within its deliberations. Dark wood panelling, the presence of armed sheriffs, a presiding officer dressed as if at a funeral, a wooden bar behind which the public must remain, stern military-like images on the wall of either her Majesty or a coat of arms - it is enough to intimidate all but the uninitiated. But from time to time, persons lose it and fling abuse at the judge, at the jury, at a barrister or at another member of the public. This is contempt of court. Contempt of court takes form as varied as human nature. Most of the time, it is a spontaneous eruption but other times, it is an asinine conspiracy. In all events, it is - mercifully - a rare occurrence. But over hundreds of years of court hearings, contempt of court has occurred. Here are the Greatest Hits of Contempt of Court. ► In Anon, a 1631 case cited as 2 Dyer 188b, a criminal defendant was found guilty of a felony. He then "'ject un Brickbat a le justice que narrowly mist" for which his right hand was probably cut off (that was the customary penalty for contempt of court in those days - right up to 1799) and he was immediately hanged. ► In R v Cosgrave, cited as 1877 Times 17 March, Lowe and Sufrin report that Cosgrave expressed his displeasure with the court by hurling an egg at the judge. He got five months in jail but before he left the courtroom, one of the judges remarked that "the present must have been intended for vice-chancellor Bacon ... sitting in an adjoining Court." ► In Harrison's Case 1638 Cro. Car. 503 and Hutton v Harrison 1638 Hut. 131, Thomas Harrison ran into a courtroom and announced "I accuse Mr. Justice Hutton of high treason", which cost him a £5,000 fine with the judge following up with a libel action, for which Thomas Harrison had to pay a further £10,000. ► Sarah Hill hired an ex-judge, California lawyer David Terry, a 6'3" 250-pounder, who carried a knife on his person. 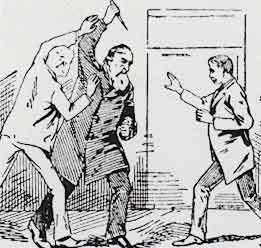 In Court on September 3, 1888, Terry didn't like a decision that went against his client and he stood and wielded his knife in open Court, threatening staff and members of the public (see picture). While in jail for the contempt charge that resulted, he continued to threaten the judge. When released from his six months prison term, he stalked the judge and was shot dead by a federal marshal. The marshal was charged with murder by the widow and the case made it to the Supreme Court published as Cunningham v Neagle 135 U.S. 1, and standing for the right of federal marshals to use lethal force where necessary. 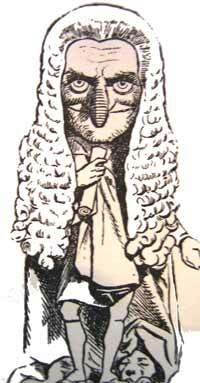 ► In Balogh v Crown Court at St. Albans 1975 QB 73, the defendant suggested to the judge that he was "a humourless automaton. Why don't you self-destruct?" Upon hearing the contempt case, Lord Denning reflected that no punishment ought to be inflicted as "insults are best treated with disdain - save where they are gross and scandalous." ► Lord Denning had unusual tolerance for contempt, perhaps because he was so folksy. In a case reported at 1970 Times 12 February, he dodged two law books thrown at him by a litigant upset at his ruling but declined to punish the woman for contempt. ► In Morris v Crown Office 1970 2 QB 114, nineteen students orchestrated their contempt by barging into a London courtroom shouting, singing and distributing pamphlets. The judge sentenced 11 of the students to three months in jail (later reduced on appeal) but only fined the other 8 students that apologized. "A, a bankrupt, brought libel actions against R1 and R2. Against R1, he was unsuccessful. Against R2, he was awarded 1/2d. On his appeal. held that he (A) should be ordered to give security for costs in the sum of £50. "A then removed his jacket, trousers and underpants and lay down in court. "Held: that a bench warrant should be issued committing A to prison for seven days for contempt in the face of the court...."
THE COURT:--I am asking you if you ever recommended that she be put in a mental institution, not what somebody else did. WITNESS:--July 13, 1965, she was admitted to the Yorkton Psychiatric Centre. MR. SHUMIATCHER:--You are not asking him, you're telling him. THE COURT:--Don't you be rude now. MR. SHUMIATCHER:--Well I don't think you should try and push this witness around, my lord, let him answer. I think it is only proper that he should be able to answer. THE COURT:--Reporter, would you please note those remarks, I will have that transcribed. ► In the People v Siegel, Marie Rodriguez appeared before the court charged with criminal offenses and immediately blurted out that she was a Puerto Rican freedom fighter and a prisoner of war and that the court had no jurisdiction on her. She was so disruptive that the court ordered that she be gagged. On April 29, 1980 she was brought back into the courtroom gag when a local lawyer, to that point with no standing in the case, stepped up and objected to the gagging of the defendant adding "this is outrageous display of the United States cruel and inhumane treatment." In considering the attorney's conduct, the Illinois Supreme Court found that she had intentionally added fuel to a difficult situation and it must of been "calculated to embarrass, and are or obstruct the court in its administration of justice." "This decision is a mockery of justice. It stinks to high hell. It says it is okay to break the law and you are immune so long as someone above you said to do it. Mr. Dowson and I have lost faith in the judicial system to render justice. We're wondering what is the point of appealing and continuing this charade of the courts in this country which are warped in favour of protecting the police. The courts and the RCMP are sticking so close together you'd think they were put together with Krazy Glue." "Most of the people in there, are there for anger management classes. Do you think that is really going to help them keep their anger intact? It sure didn’t keep mine." Lowe and Sufrin, The Law of Contempt, 3rd Edition, London: Butterworths, 1996. The People v Siegel 445 NE 2d 762 (Illinois, 1983) as summarized in American National Judicial College 1994 edition of The Judge's Book, p. 280. Niagara Gazette, Nov. 27, 2007, "Restaino Ordered Removed".